When I was younger I was fascinated by documentaries and books featuring explorers attempting to climb and reach the summit Mount Everest, the tallest mountain in the world. Watching these climbers risk their lives and push past their limits to accomplish their biggest dream ignited a fire within me to explore the world, pursue my passions and step out of my comfort zone. These stories also served as inspiration during some hard times in my life. 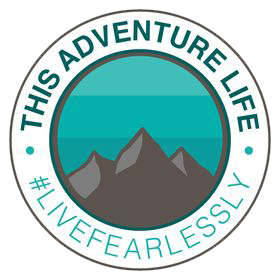 I was inspired by their passion, determination and pursuit of the ultimate adventure. Mount Everest always called to me, and when I got the opportunity to trek to Base Camp, I jumped right on it. 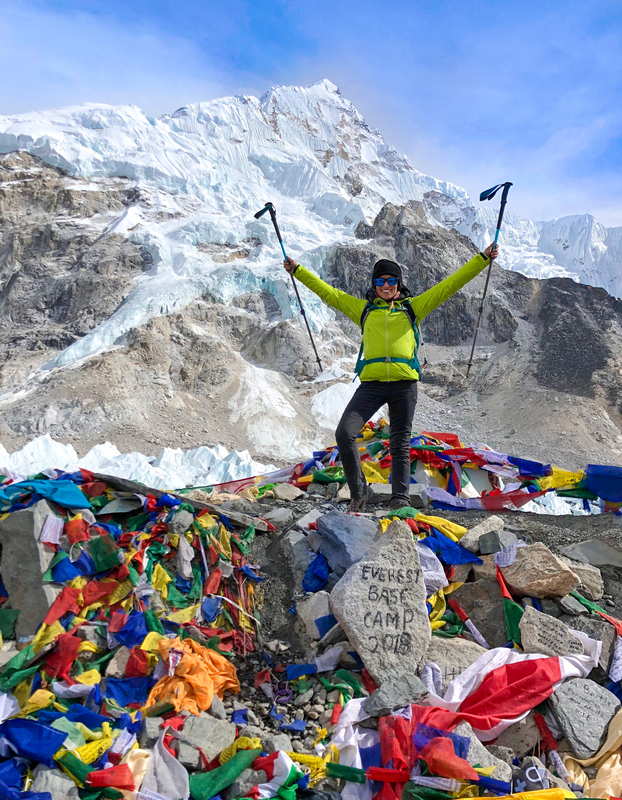 Call me crazy, but my opportunity to trek to Everest Base Camp was scheduled just two weeks after reaching the summit of Mount Kilimanjaro, and I took it without any hesitation. It seemed like the perfect time to go; I had already been to over 19,000 feet and was fine with altitude, I was already traveling and I am always down for the next challenge. 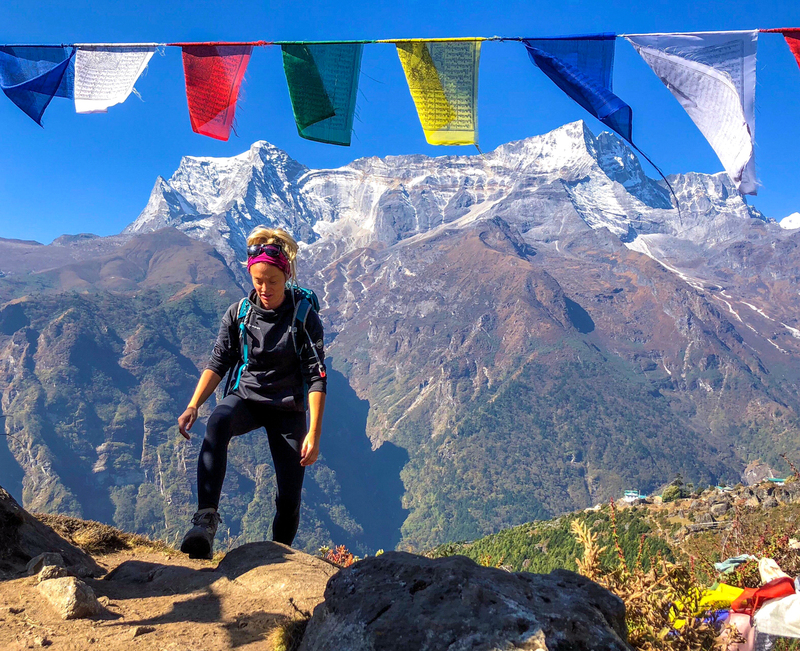 After Kilimanjaro I spend about a week resting up in Thailand, and then eagerly set off for Nepal to explore the Himalayas and reach another one of my big adventure goals. My first few days in Nepal were spent in Kathmandu, the capital city. Kathmandu is a city of extremes and contrasts. It is dusty, chaotic, crowded, noisy, polluted and yet there is still something appealing about it. I think the allure of the city lies in the culture and the contagious personalities of its people. I stayed in Thamel, the tourist district. My first few days were spent getting completely lost and enjoying the local cuisine on rooftop patios. Eventually I became tired of being lost and hired a driver so I could photograph some of the temples just outside Thamel. 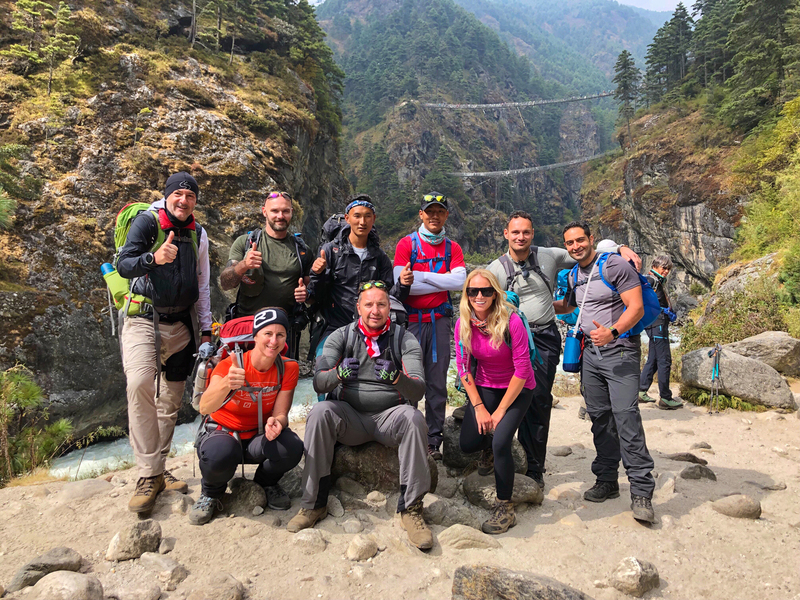 The day before the trek, I met the members of the trekking group and went on a city tour and traditional Nepalese dinner. Everyone in the group was such a character, and I knew that we would all get along. Spoiler: we did, and are still good friends. Today was the day we were supposed to take our epic flight into Lukla and start our trek through the Himalayas. Today was also the day we waited at the Kathmandu airport for 6 hours just to board our flight and turn around because of cloud cover and land in a one-goat village named Manthali. I was not surprised to learn that this happens quite often, as Lukla has crazy weather in the afternoon. I was a bit disappointed and cranky (as was everyone else), but I decided to embrace the adventure and have a good time. There really was nothing to do in Manthali, so we ended up having dinner and going to bed relatively early. 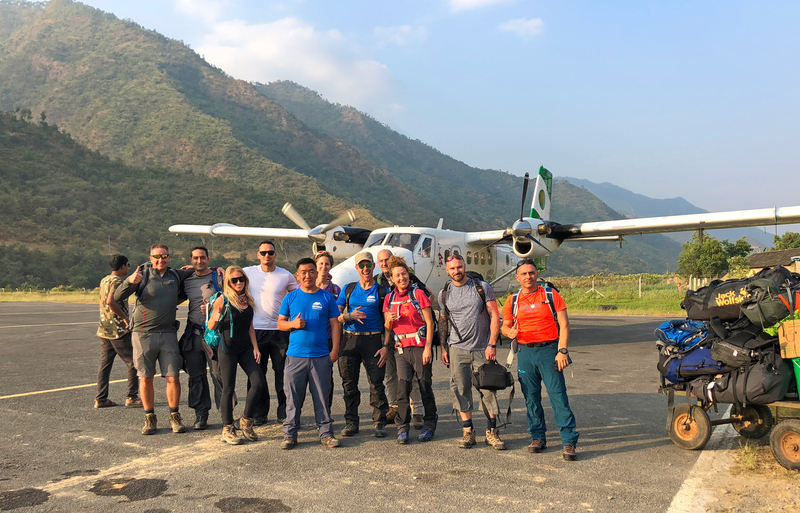 We needed an early start, as we wanted to get to the airport before the other groups of trekkers and get to Lukla as quickly as possible. Trust me, you will always want to fly out early. Lukla is notorious for having unpredictable weather, and is usually shrouded in clouds come afternoon. I woke up unsure, yet hopeful, this morning about the status of our flight to Lukla. Having missed a day on the trek, and spending it in the village bummed me out quite a bit, but I tried to see the detour as somewhat of an adventure. By the time we reached the airport, I was ready to get out. It seemed like one of the longest waits for a flight. But I think it was only a few hours. We were all anxious to leave and start the trek, and were planning on booking a helicopter out when our guide told us the plane was on its way. I’ve heard that before. But, within an hour, we were on the plane and flying to Lukla. This time the sky was clear and blue. No clouds in sight! I had been looking forward to this flight for a long time for many reasons. The Lukla airport is often considered “the world’s most dangerous airport” due to its short, angled runway strip and surrounding mountain terrain. In reality it’s actually pretty safe. A good number of flights come in and out every day, and the pilots are highly skilled. Still, there were a few moments that got my adrenaline going. We hit a bit of turbulence as we made our way to Lukla, and I could see the look of horror on some of the faces of my fellow trekkers. 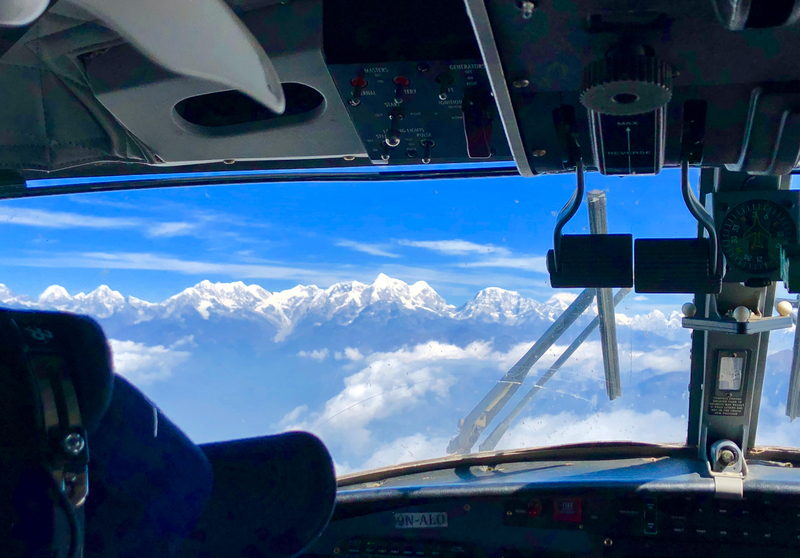 I had faith in the pilots and my journey and decided to treat it like any other flight, although it sometimes felt more like a roller coaster ride. I would say the most exciting part of the flight was when the massive mountains were right in front of us; we seemed to be flying straight into them! We even got our first glimpse of Mount Everest. I could see the small runway below us, and for a split second wondered how the hell we would land there. Within minutes we were on the runway, after a perfectly executed landing. I seriously wanted to dance out of the plane and on the runway, but those dreams where shattered as I was quickly ushered into the small airport to gather my bags. Maybe one day. Once on the ground so many emotions took over. I was happy to be alive after the flight, excited to start the trek and in complete awe of the landscape that surrounded me. The Himalayas were massive! I had never been the presence of a mountain over 20,000 feet high. And here I was surrounded by peaks ranging from 18,000 to 29,000. It was surreal. Our first objective after we got our luggage was to meet the rest of the team (we had four guides and five porters) and eat lunch. I was advised before starting the trek to keep a vegetarian diet on the trail, as the meat can be pretty dodgy. Why, you ask? Well, the meat is often flown in to Lukla from Kathmandu and then carried by porters to various villages on the trail. The higher in elevation (and further from Lukla) you are, the higher the chances are that the meat may not be fresh. This results in getting food poisoning, which can ruin your entire trip. Save yourself from endless bathroom breaks and eat vegetarian options. You can eat meat once you are back in Kathmandu. We immediately hit the trail after lunch, as we wanted to make good time to Phakding, where our teahouse was located for the night stay. In total the hike took around three hours. It was an easy day, and a good introduction to the trek itself. On the way we passed many eager hikers starting the trek, exhausted hikers coming back, porters and yak-cow hybrids carrying supplies. We learned a lot about the region and the culture from our guides. Information such as: walk clockwise around stupas and Buddhist shrines (keep left); it supposedly brings good luck. I’ll take all the good luck I can get, after that flight drama! Spoiler: Maybe it’s that I walked clockwise most of the time, but we ended up having perfect weather the entire trek. Listen to your guides! Tomorrow it’s off to Namche Bazaar, the bustling capital of the Khumbu Region. Like most days on the trail, my alarm went off at exactly 6 am. Time to pack my bags, get breakfast and hit the trail! 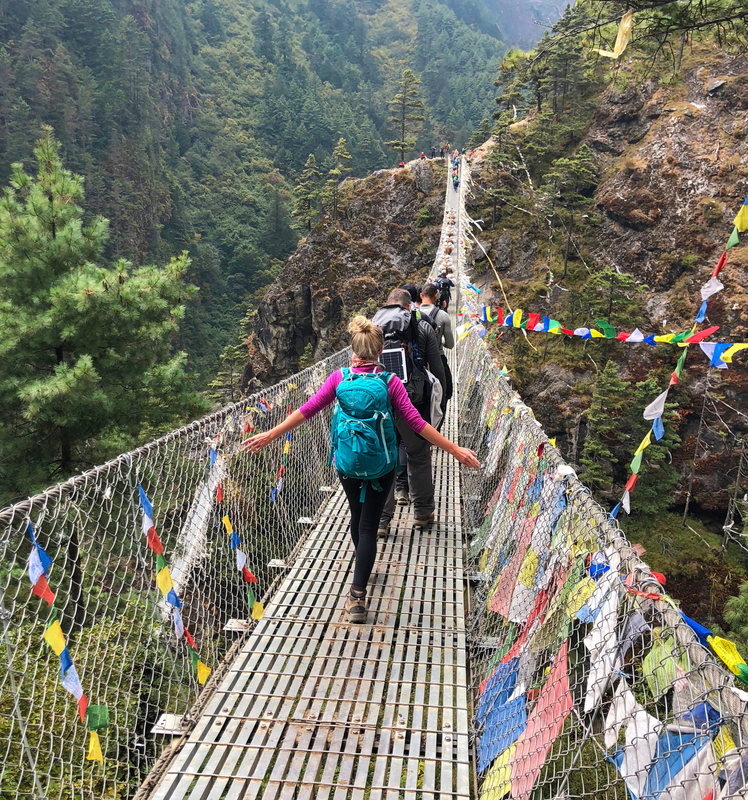 Today we made our way out of Phakding and started the long trek to Namche Bazaar, where we would be for two days (Skyhook usually offers three, but we lost an acclimatization day due to the alternate landing). 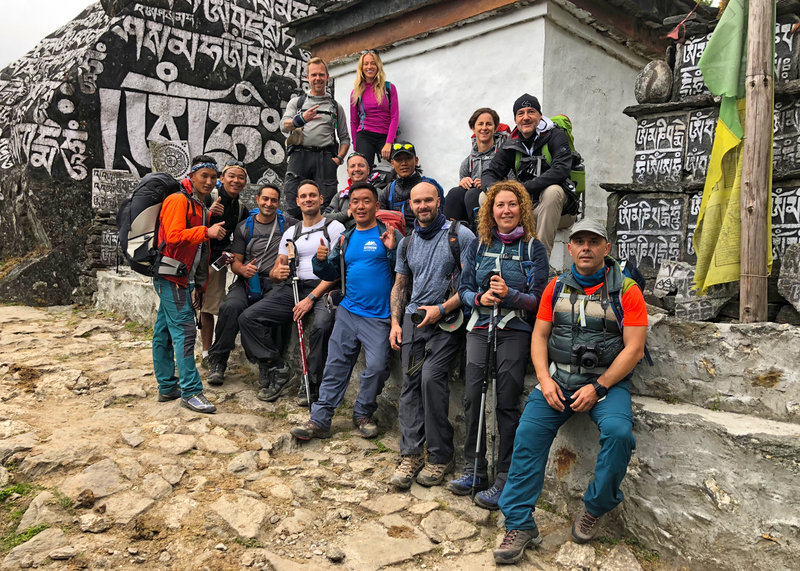 The acclimatization days on the trek are meant to help get you adjusted to the changes in altitude to avoid serious symptoms of altitude sickness as you ascend. I woke up to a cold, yet perfectly clear sunny day. I was seriously ready for a more challenging hike and to get to higher elevations. Within minutes of walking it was time to shed the layers, as it gets a lot warmer when the sun hits you. Be prepared for a lot of layer changes throughout each day. Weather and temperatures can change quickly. We had heard that today was one of the harder days on the trail, and to a certain extent it is. During this trek, we would gain about 2,700 feet in elevation and hike around 4.5 miles. In total, we spent roughly six hours on the trail, and that included a tea break and lunch. The first half of the hike is relatively easy. It was beautiful, and lots of views of river as you make your way into more mountainous terrain. I really enjoyed crossing the suspension bridges above the river. Yes, they are a bit sketchy. But that’s half the fun isn’t it? I recommend taking in the views from the bridges, as you get a stunning view of the mountains in front of you and the glacial river below. The most challenging part is the last few hours to Namche Bazaar. It is a lot steeper, but luckily there are switchbacks to help ease the pain. The clouds started to roll in as we began the final few hours of the trek, and it was yet again time to layer up. We took a break to put on our layers and get hydrated at relatively famous lookout point. 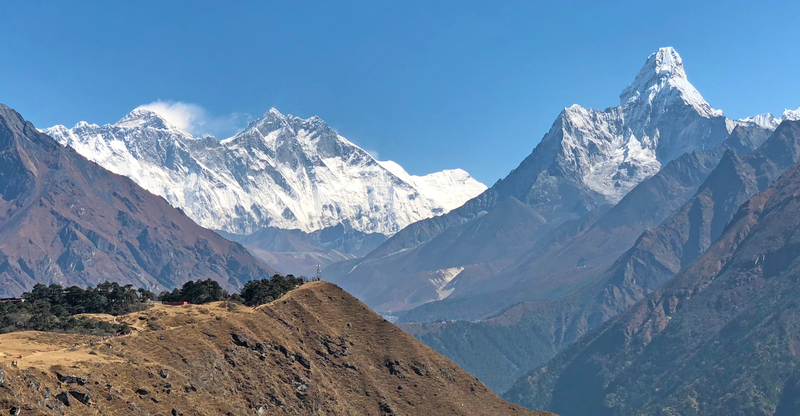 On a clear day, you get to see Mount Everest, usually seen with a plume of snow blowing from the summit. Two people in our group became sick, and my guess it was from eating food that may not have agreed with them. They were troopers throughout the whole trip though, and I am still super impressed by their tenacity and determination to this day. If you do get sick early on, there is a hospital at Namche. Go there, get checked up and get some medications. Make sure to get plenty of rest and drink lots of water. Only push on if you feel you absolutely can. The clouds started rolling in as we neared our final destination for the day. 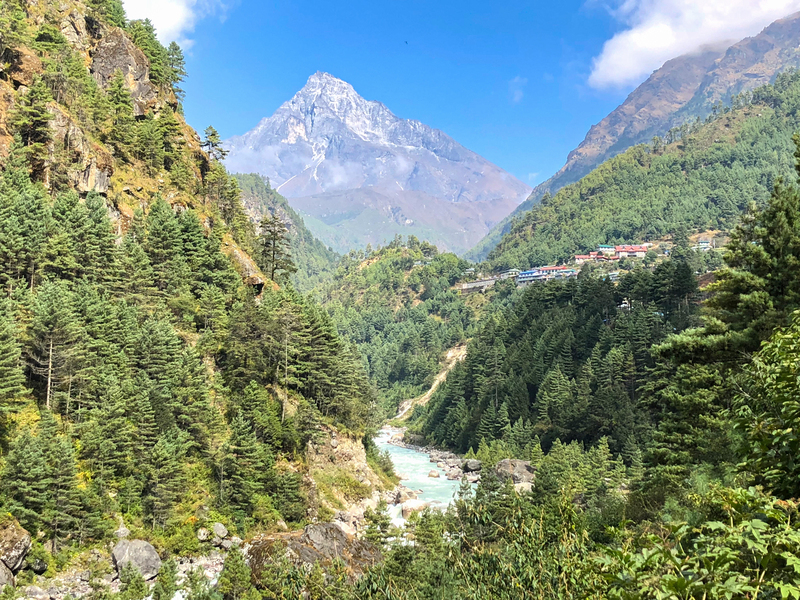 Namche Bazaar, the gateway to the mountains, is a bustling village complete with local and brand name shops, bakeries, merchants selling crafts, an Irish pub, spa that offers massages and sauna time and even a hair salon! (Confession: I used the hair salon. Twice. 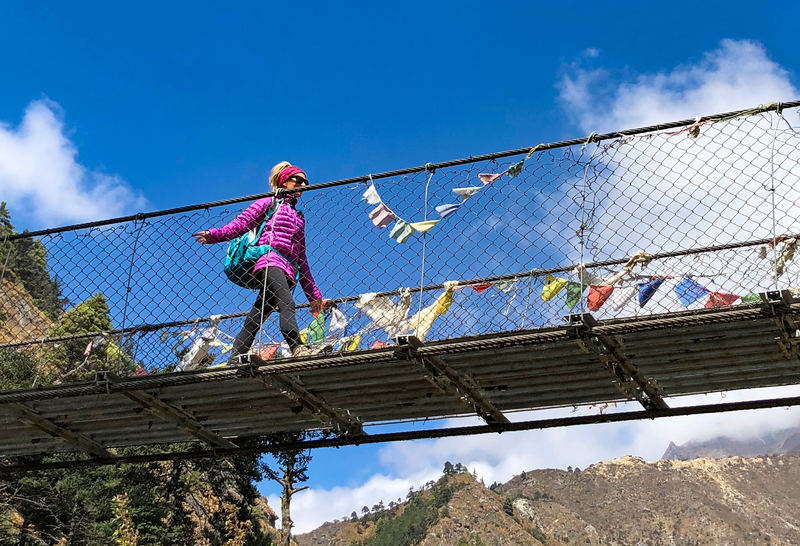 Once before leaving Namche because I refuse to wash my hair and let it air-dry at higher altitudes; that can result in pneumonia or at least a nasty cough. The second time was when I got back from Everest Base Camp, and desperately needed some maintenance). Today we woke up at a more reasonable time and made our way to the famous Everest View Hotel from our teahouse. I had heard that this was one of the best places to take some photos on the entire trail, and was excited to check out the 360-degree views of the surrounding mountains. Since the hike isn’t that far and lasts just a few hours, I suggest that you use the opportunity to have a light daypack. I just brought water, some granola bars, a light windproof jacket and my camera. It does get a bit windy up at the viewpoint, so definitely pack an extra layer. We left the teahouse and immediately began climbing the stairs out of Namche. After climbing for a bit there is a junction with two paths. The path that goes straight leads to Everest Base Camp, and the path on the left goes to the Everest View Hotel. Keep left today. 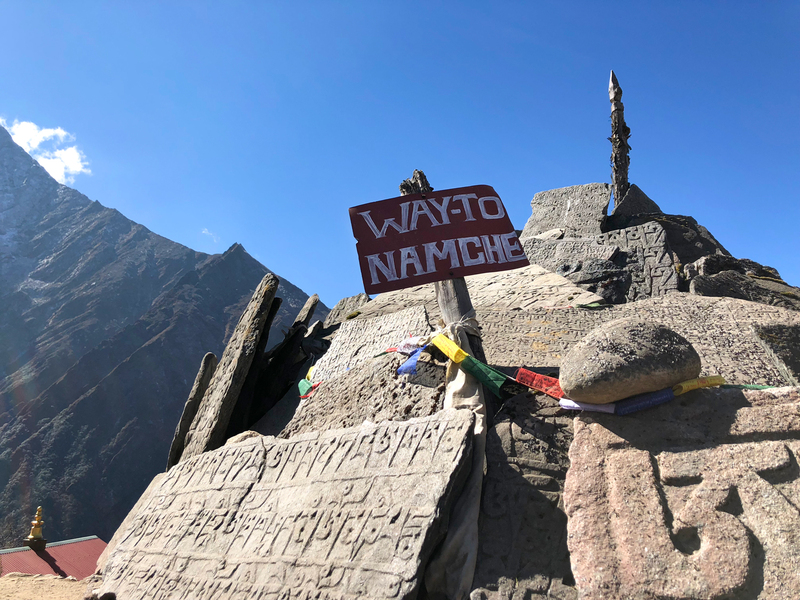 As you ascend, make sure to stop and check out the views of Namche Bazaar below and the majestic peaks surrounding you. The hike itself is not that hard, it is just the altitude that some people have a problem with. A few people in the group had headaches and were a bit winded from the hike. If you start to feel sick make sure to take a break, take a few deep breaths and drink some water. The view from the top is incredible, and I am so thankful that we had perfect weather and clear blue skies. From where we were standing we could see Mount Everest, Ama Dablam, Lhotse and more. After the hike we made our way to a museum dedicated to the history of the sherpas in the Everest region. It was really interesting to get a glimpse into the sherpa culture and hear about their history. After we toured a replica of a sherpa house we got to see a slideshow and exhibit of expedition photography. 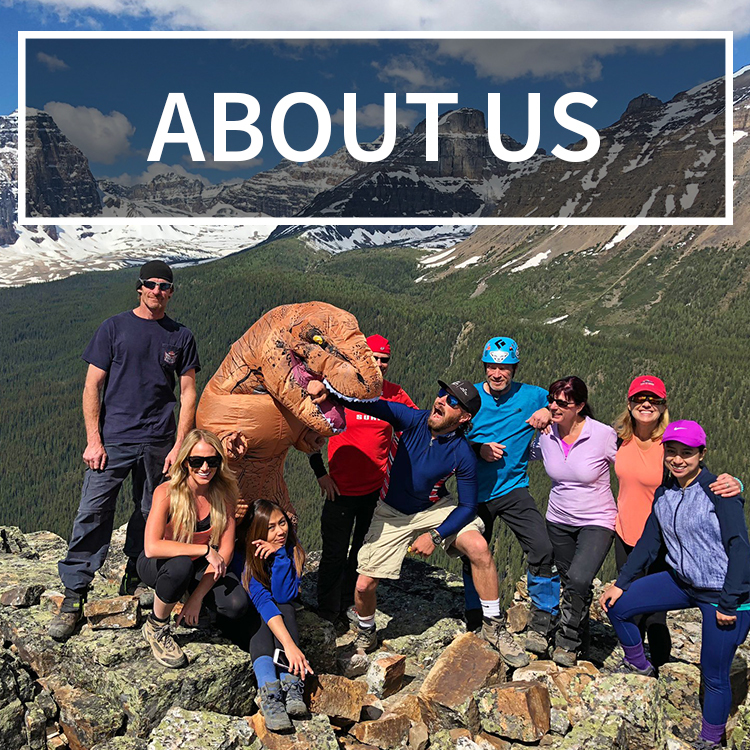 I think it’s safe to say we all came out of this experience with a greater respect for the people of the region and a strong desire to one day climb that mountain. I had come to really love Namche Bazaar over the last few days, and hated to leave. But it was time to push on, and I was pretty exited to get one step closer to Everest Base Camp. And, I had heard that this part of the trek had killer views of the surrounding peaks. We left the teahouse around 8 am and immediately hit the trail. We came across the junction again today, and continued straight on to the trail that leads to Base Camp. The fist part of the trail is really gradual and easy, complete with stunning mountain views at every turn. 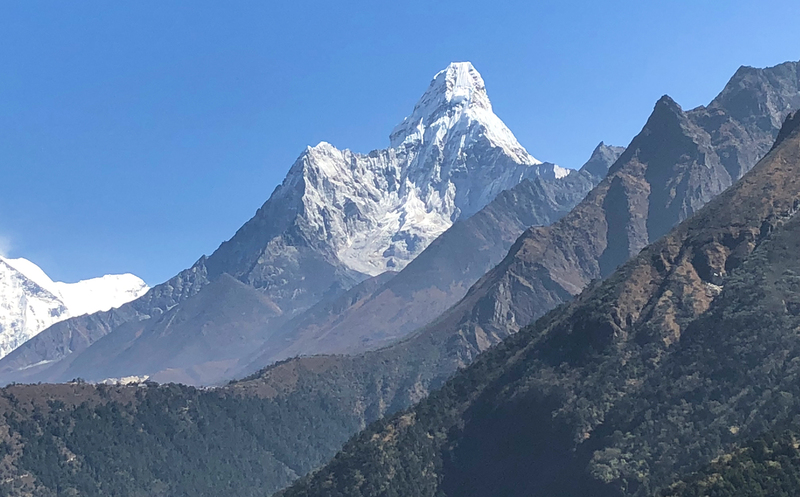 Almost immediately, epic views of Ama Dablam came into view. 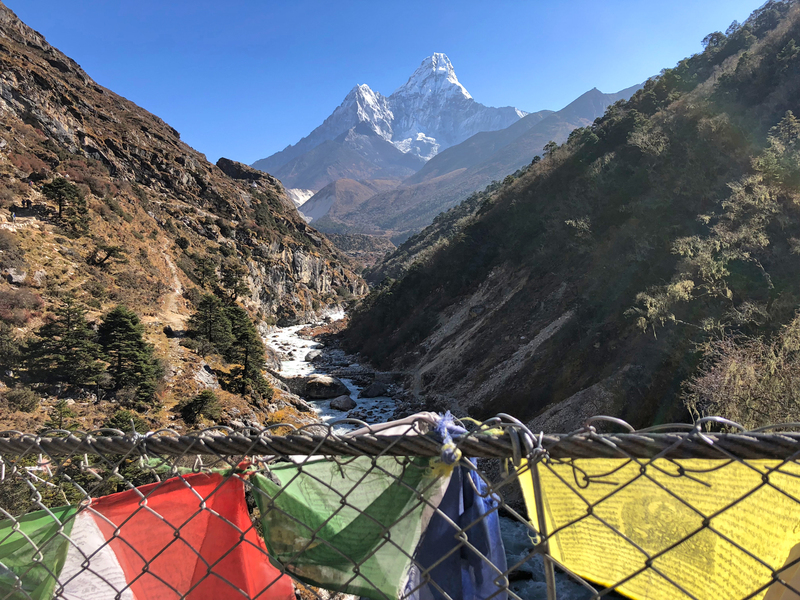 Ama Dablam is one of the most famous mountains in the Himalayas, and for good reason. What it lacks in altitude, it makes up in sheer beauty and technical difficulty. It’s impressive, and definitely stands out in the landscape. After a few hours it was time for lunch. The clouds were starting to roll in yet again, and I was just happy to have had clear skies in the morning to get some shots of the mountain peaks. Be prepared to make a lot of photography stops! 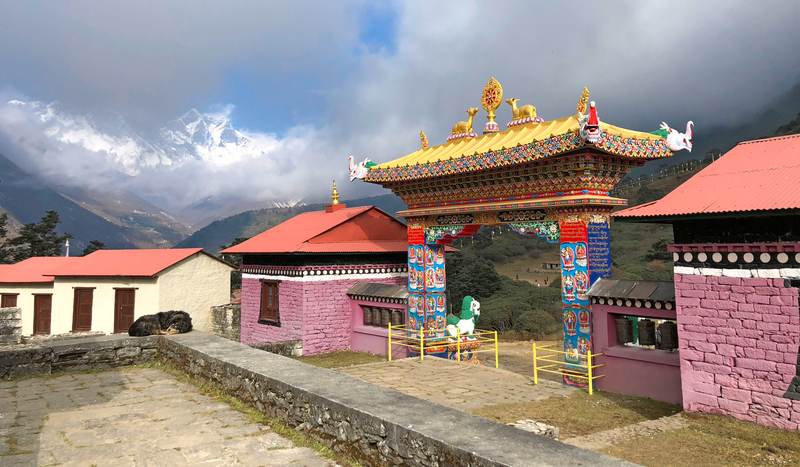 We then set out to visit Tengboche Monastery, the main Buddhist monastery in the Khumbu region. 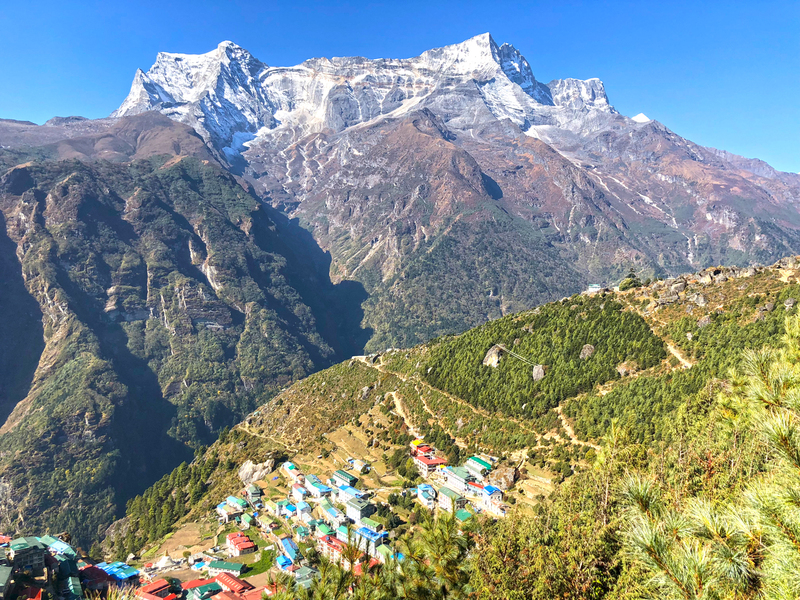 Situated at just under 13,000 feet, Tengboche is the highest point you will visit this day. After walking around the monastery grounds, we got to view a prayer ceremony. It was just a short descent to Debouche, our home for the night. We ended up playing card games with our guides after we ate. It was a really great way to get to know each other and let loose after the hike. I highly recommend bringing cards, and thank the trekkers in our group for the brilliant idea. If you thought the views from the previous day were good, you are definitely in for a treat today. It’s a relatively easy day, as you will be hiking a gradual ascent to just over 14,000 feet. This will be your first of the next four days sleeping above 14,000 feet. It was this day that I noticed more people in our group with signs of mild altitude sickness: headache, shortness of breath and feeling lethargic. 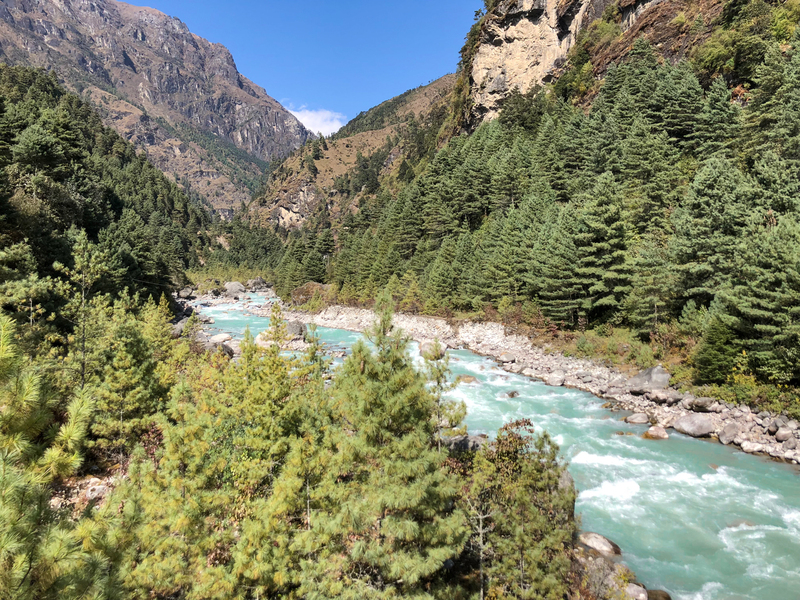 Because you will be staying at over 14,000 feet, I highly recommend you take Diamox during these days until you descend Everest Base Camp and Kala Patthar. Today we had another acclimatization day, this time at an altitude of over 14,000 feet. Most people on this trek had never been above 14,000 feet so I cannot recommend participating in this hike enough. Remember: hike high, sleep low. We woke up around seven, had breakfast and left a little after eight. I gotta say, I do love the schedule of these acclimatiaztion days. The ascent itself was pretty easy (if you are feeling well at altitude), and was full of stunning 360-degree views of the surrounding mountains. Again, make sure to give yourself a rest on this hike and pack light. Bring water, snacks, an extra layer and a camera. We hiked the hill that overlooks the little town, and it took a less than two hours in total (including lots of photo breaks). After we got back from the hike we met up with some friends from the trail and hit up a local cafe for delicious snacks and watched a movie on the local helicopter rescue companies. It was fascinating to see how much these pilots risk their lives to save the climbers and trekkers, and put a lot of things in perspective. After watching this I knew I wanted to be better prepared before I took on any more technical or higher altitude climb. Today we set out for Lobuche, our final teahouse before we made our way to Everest Base Camp. We covered just over 5 miles and an altitude gain of around 1,500 feet. We began the trek just as we started our acclimatization hike the day before, and when we hit the junction we turned left instead of ascending the hill. It was an easy walk through the valley, complete with lots of trekkers eagerly headed to Base Camp. We crossed the river and stopped at Thukla for lunch, and then it was time to hit the trails. This time, it was a fun and relatively steep ascent up to the pass. 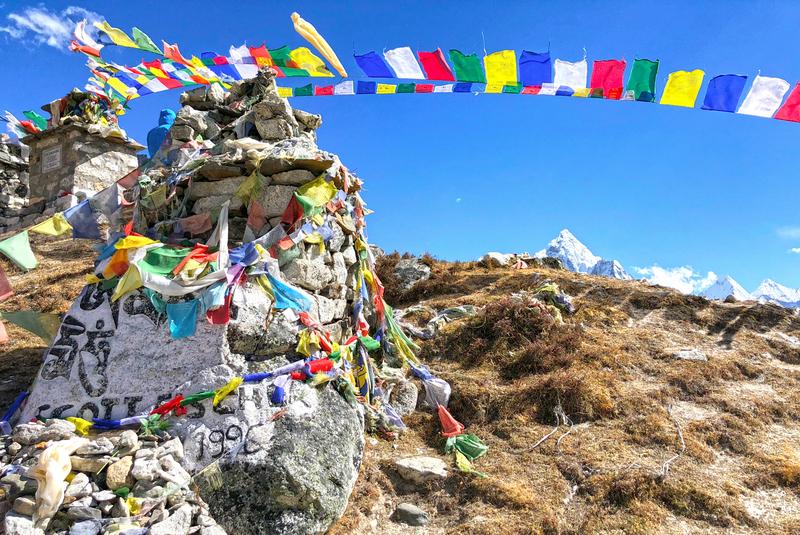 Once at the pass, you will see lots of prayer flags and memorials honoring the people who lost their lives attempting Everest. Take a minute to really look at each one; I guarantee their stories will inspire you to chase your dreams, no matter the cost. After wandering through and reading the memorials, I found a really beautiful lookout spot that showed how far we had come. When I get physically tired or mentally exhausted I like to re-trace my steps and see my journey. It shows me that I am capable of achieving my dreams, just one step at a time. 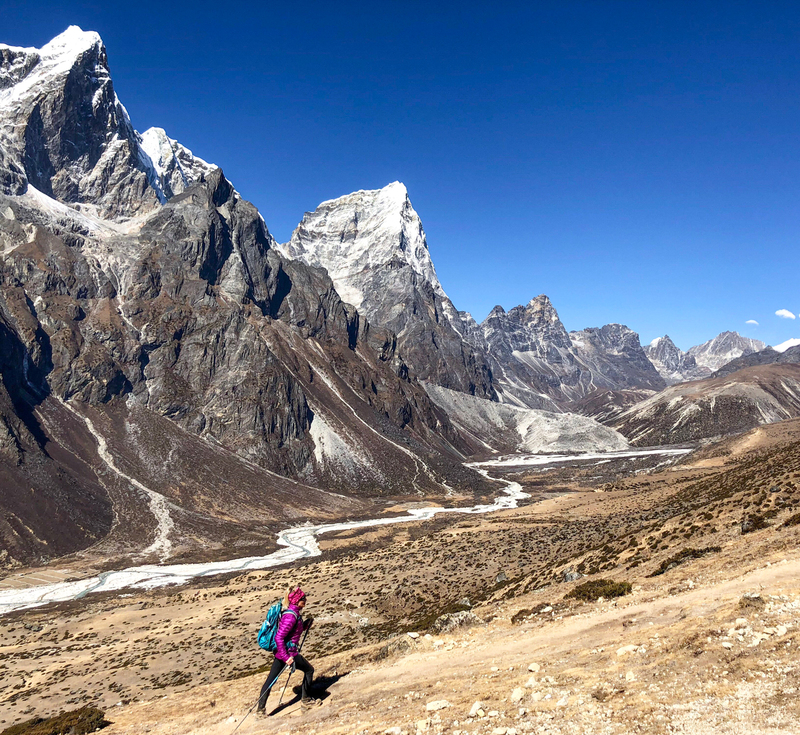 After a short break, it was time to head to Lobuche. 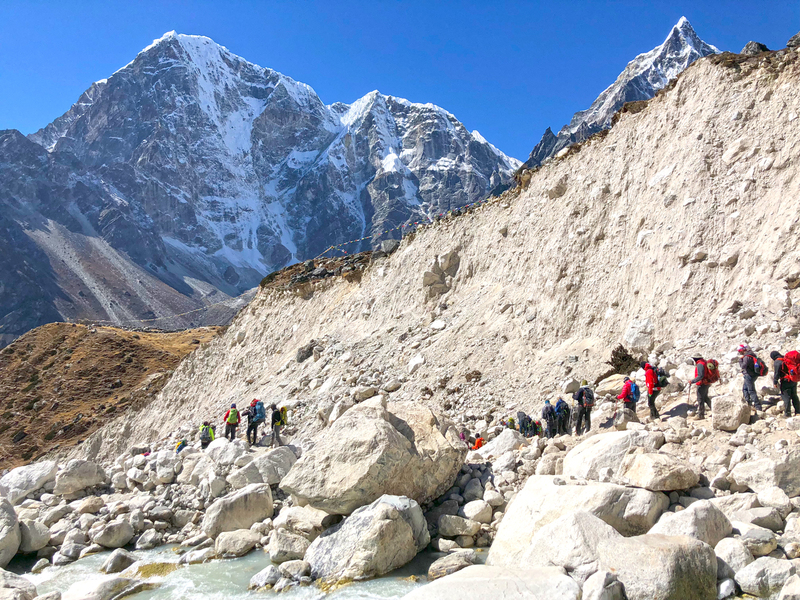 It’s a pretty flat hike alongside the Khumbu glacier, but don’t get too comfortable. Once you get to the teahouse you will be offered a short acclimatization hike yet again. It will most likely be cold and windy, but take advantage of it. From the top of the acclimatization hill you will get views of the glacier and Everest Base Camp in the distance. After so much planning and training, it was finally here! We would trek to Everest base Camp the next day. This is the big day! This is the day we had all come here for, and trust me when I say it’s the best day on the trek. We woke up early, as this is a very long day. 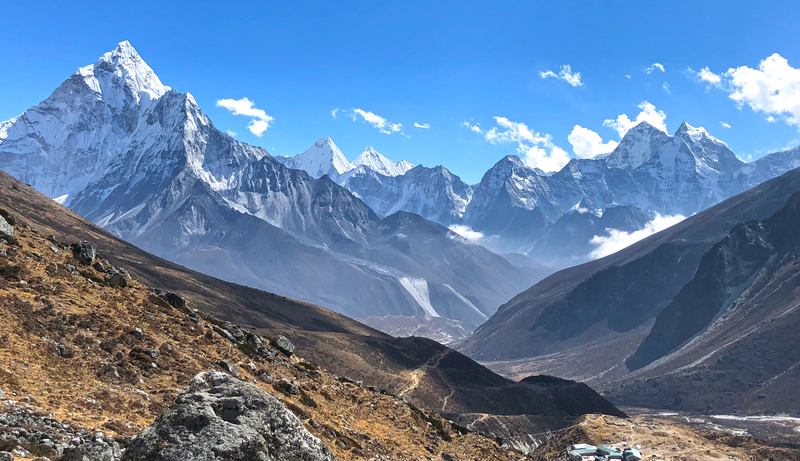 From Lobuche we made our way to Gorak Shep, the last stop before Everest Base Camp. At just under 17,000 feet, Gorak Shep was the original base camp for the climbers before they switched to a closer location. Here, it is also a lot colder, so make sure to wear all of your proper layers. The entire walk from Gorak Shep to Everest Base Camp can be cold and windy. We had lunch at Gorak Shep, got our rooms and things together and hit the trail just around 1 PM. The trail to Base Camp is not that hard, more of a gradual climb, but the altitude makes it a lot harder. 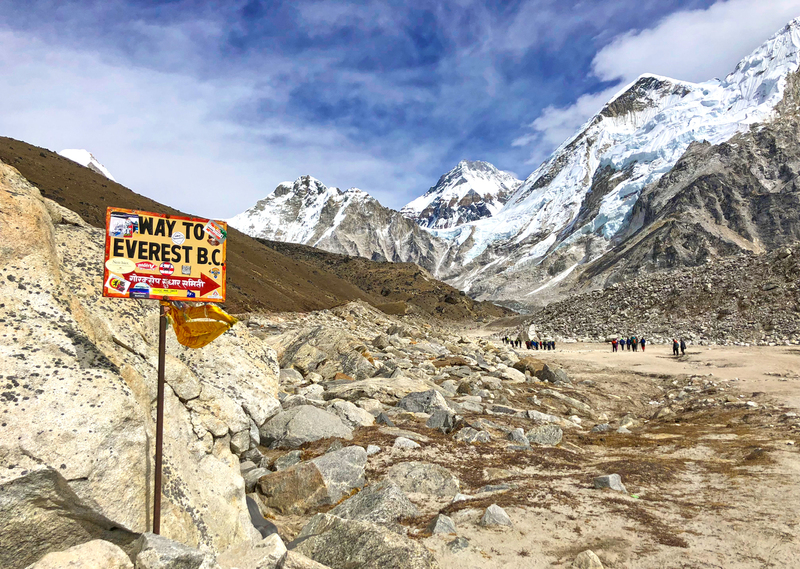 Everest Base Camp sits at around 17,500 feet, so you gain about 500 feet in elevation in a few hours. Not bad, just make sure to focus on your breathing and stay hydrated. 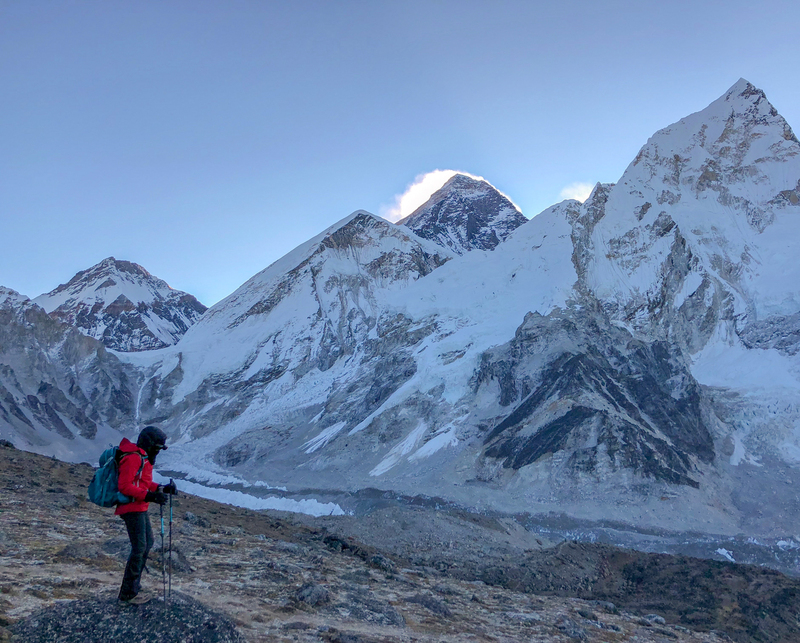 On a clear day, you can get a glimpse of Mount Everest as you make your way to Base Camp (remember, the best view is up Kala Patthar). 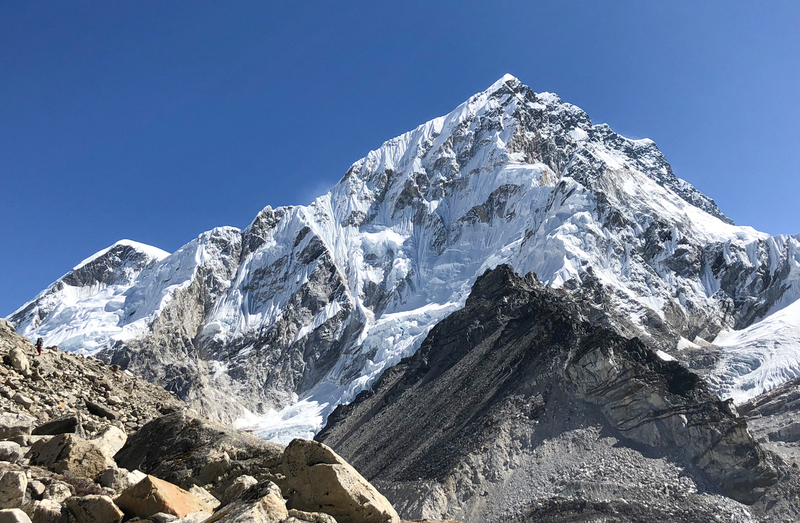 The peak itself sits behind Lhotse and Khumbutse, and honestly doesn’t look as massive or as tall as it is. Seeing it that close up inspired so much awe in me. I had only seen it before in documentaries, photographs or farther away on the trail. Now I was here: face to face with the legend himself. Towering over 11,000 feet above me, Everest reminded me to stay humble. It reminded me that as high as I have climbed, I am nowhere near its level. Maybe in time. Once we reached Everest Base Camp, it was time to celebrate. Everyone was in high spirits, and everyone in the group had made it. I was so proud of all of them. Honestly, my happiest moment on the trail was watching everyone overcome their illnesses, doubts and fears and reach their goals. I made sure to place some prayer flags at the marker. Prayer flags symbolize the elements of the earth: sky, air, fire, water and earth. Together, they create and signify balance. When the wind blows them around, it is said they spread positivity through the air. 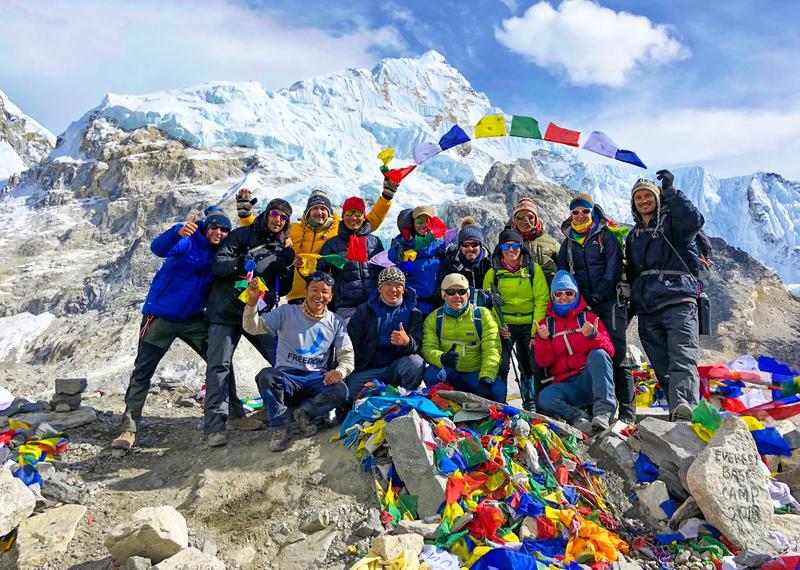 We left Everest Base Camp feeling accomplished and so much stronger than before. You could just feel the happiness and pride radiate among the trekkers as we made our way back to Gorak Shep for the night. At four in the morning, the three craziest people in the group (myself included) set off for Kala Patthar. It was an extremely cold morning, but we once again lucked out with clear skies. Similar to the Kilimanjaro trek, we set out in the dark and followed the glow from the headlamps. Almost immediately, I noticed my hands were extremely cold. I was wearing 2 layers of gloves, and figured if I just moved my hands around I could create warmth and be alright. I was so wrong. The three of us ended up making the first summit, and from there the other two guys decided to go down. They were cold, tired and already content with what they had accomplished. I wanted to push forward. My guide told me it would be a good idea to descend because my hands were cold and shaking, but of course I was too stubborn and kept walking. A few minutes later I couldn’t feel my hands anymore and decided to call it a day. I had already been to the first summit and was worried about the condition of my hands. We quickly descended and went back to the teahouse where I warmed my hands up and got some mittens. Personally, I would love to do this hike again, but with a later start to be warmer and to see the mountains fully illuminated by the sun. Kala Patthar in and of itself is not a hard hike, it is just cold if you go in the morning. Prepare better than me and you will be fine. After breakfast we all set out for Pangboche instead of Pheriche. We decided to stay there because it was closer to Namche Bazaar and it was owned by the family of one of our guides. It was a long day, and I definitely fell asleep as soon as I hit the bed. 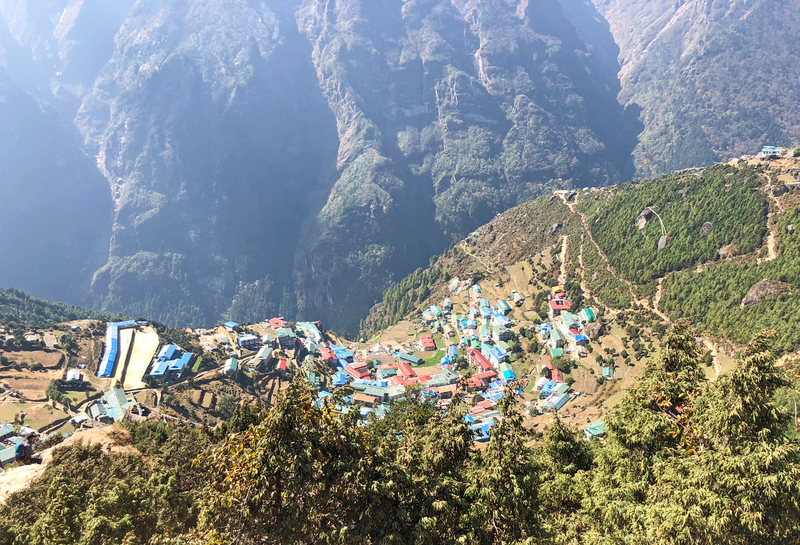 I cannot tell you how excited I was to wake up this morning with the realization that I would soon be back in Namche Bazaar, where I could have a long hot shower, wash my hair and do my laundry. And that’s exactly what I did when I got back. It was a relatively moderate day. Not a hard hike at all; we were just tired. You will pass the monastery again and hit the same trail back to Namche. Even when the clouds rolled in, it was stunning. I had to get a few last looks of the peaks, as they cannot be seen once you are in Namche. Honestly, today was the most exhausting day on the trail for me. 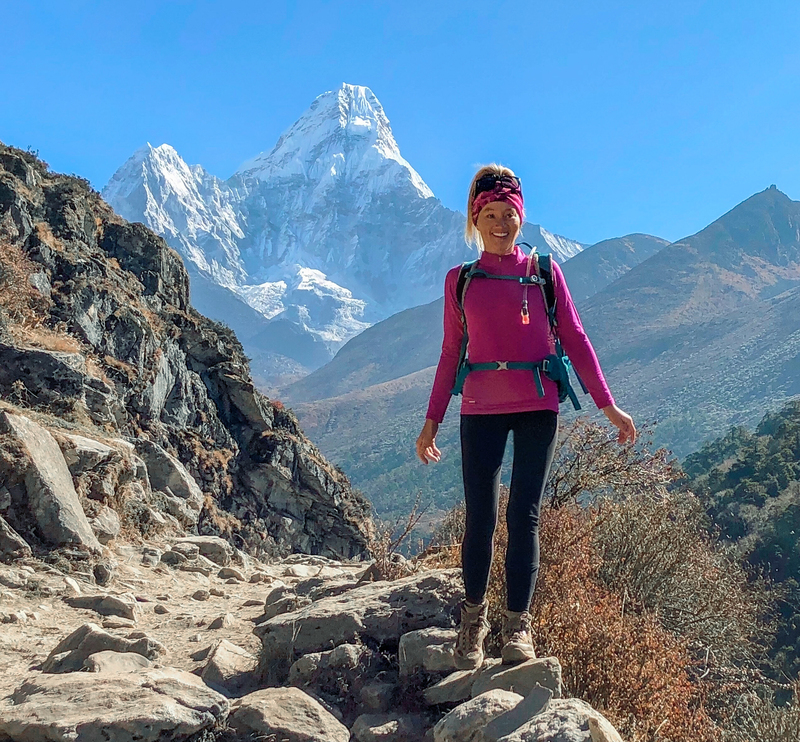 All of the miles I had hiked (Everest Base Camp trek is well over 70 miles), elevation changes I had encountered, and the lack of nutrients from the local diet had caught up to me. Not to mention I had summited Kilimanjaro over a week earlier. My body and mind were just done. I was craving rest, but I had miles to go until Lukla was in sight. When we got back, I got my second wind. We had our dinner with our guides and porters, and later danced until late. It was such a fun way to celebrate our last day in the mountains. So much fun that I forgot how tired I truly was. We woke up early today, as we were determined to fly out and get back to Kathmandu before the weather turned. It was a cool, clear morning and I was hopeful that we would make it without ordering a helicopter. We ate our breakfast quickly and went straight to the Lukla airport, just a few minutes away from the teahouse. We were early, and told that we would fly out in a few hours. Lucky for us, this time there were no delays and after a few hours we boarded the plane back to Kathmandu. The flight went smoothly, and honestly I was too tired to even really pay attention. My body and mind were tired and all I wanted was a shower and a nap. I can’t even tell you how happy I was to get back to the hotel in Kathmandu and feel like a part of civilization again! That night we celebrated with a group dinner and danced for hours at a little reggae bar. It was such a fun way to end the trip. I’m still amazed that I had the energy to dance until the early morning after all of that trekking! The next day, I left Kathmandu for California. My heart was so full from this experience. 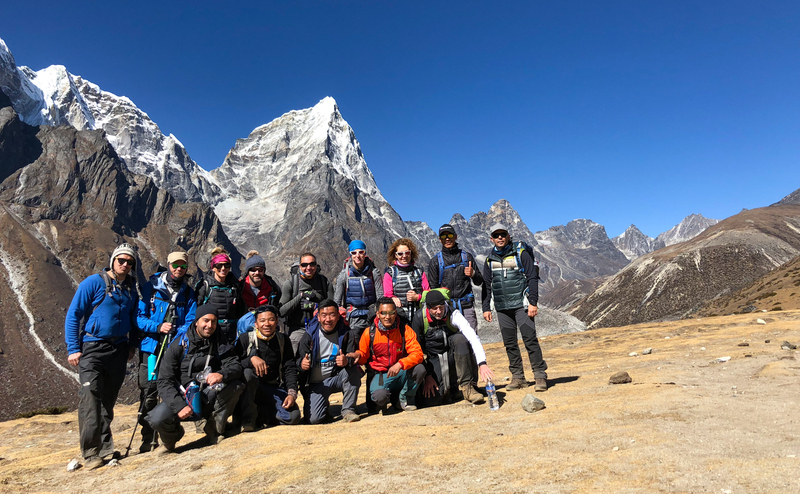 I cannot thank Skyhook Adventures, the trekking crew and the guides and porters enough. I will be back. 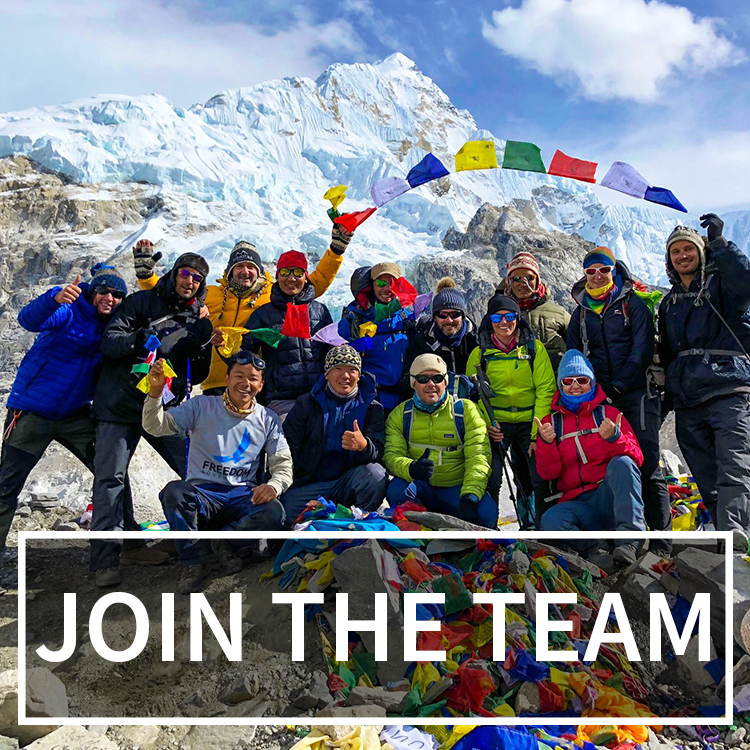 Want to trek to Everest Base Camp with Skyhook Adventures? Click here to get started!